The Annual Richmond Family Fireworks Display will take place on Sunday 3rd November 2019 at the Athletic Ground, Twickenham Road, Richmond, TW9 2SF. Every year Richmond Athletic Association stages a spectacular evening of family fun with a choreographed fireworks display by multi award-winning Phoenix Fireworks. There will be live entertainment prior to the fireworks spectacle as well as funfair rides, mulled wine, hot food, candy floss and popcorn stalls and an after-party in the Members Bar. ​ Gates will open from 4.30pm with the fireworks display set to take place at 7pm sharp. 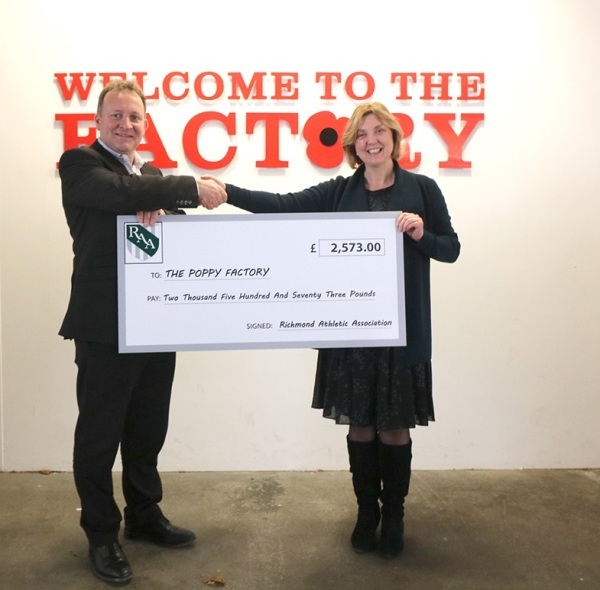 The RAA were delighted to support The Poppy Factory at this years Fireworks Night and have presented a cheque to them for £2,573. The principle role of The Poppy Factory is to support war veterans with physical or mental health conditions find on-going employment back in the workplace.